When Dalya Luttwak was invited to do a site-specific installation for the Kreeger Museum, she took the path less traveled, literally. On the periphery of the museum grounds stands a decaying tennis court, once used by former residents David and Carmen Kreeger. 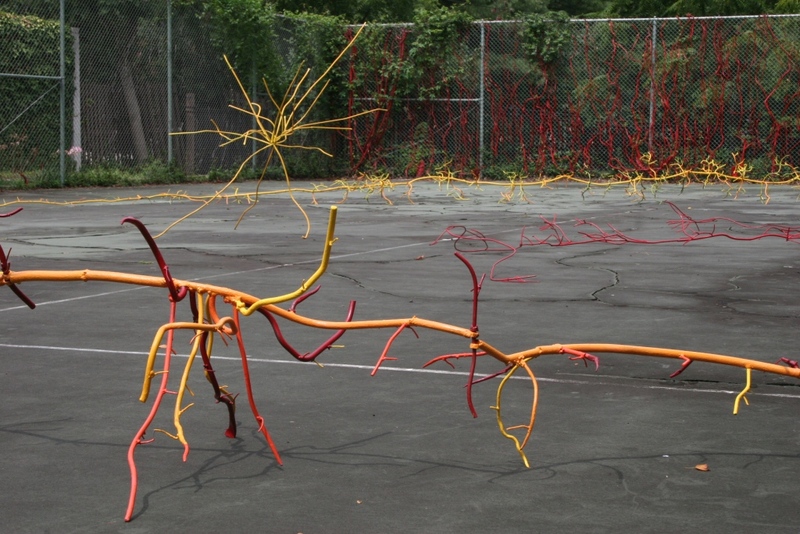 Luttwak calls attention to this forgotten space by weaving her larger-than-life root sculptures into its landscape. I met up with the artist at the Kreeger Museum, where she described her installation, at the intersection of art and nature. Dalya Luttak, When Nature Takes Over, 2011. Painted steel, roots and vines. CB: Your sculptures unearth what is hidden underneath the soil, subverting its visual presence. What prompted your interest in roots, and what is your approach to transforming them into sculptures? DL: It is one of those things that you only understand much later. I’ve been doing sculpture for maybe 30 years; I’ve called it by different names, but that was what I was doing. Ten years prior, I started collecting roots on my walks because sculpturally, they intrigued me. I never thought of doing anything with them, because who am I to compete with nature? One day, we had a tornado go through our street and a huge tree next to our driveway collapsed on my car. As I was taking pictures for the insurance company, I realized that the root system of this enormous tree was so shallow. I thought: “How strange, how could a tree of this size have so little support?” I liked that conflict, and I started studying the root system of this particular tree. Artists re-create what they see and they also re-create what they imagine. But roots are by nature hidden, so my idea was to uncover. To uncover what I, as an artist, don’t see. I then let my imagination do whatever. But I try very much to stick to the roots, the way they are really constructed. The more I sculpt them, the more I realize how different each root, each plant, each tree is, and the more I am fascinated by what I see. CB: The roots have a psychological dimension that conjures up that which is hidden or unconscious in our own lives. How are the roots metaphorical for your personal history? DL: My family roots were cut and distorted by the Nazis in Europe, but I am deeply rooted in the creation of the state of Israel. I am the first generation. My roots consist of two extremes: the annihilation of the Jewish people and the creation of the Jewish state. The contrast between the two makes me cherish my roots, broken as they are. CB: The tennis court at the Kreeger has been neglected for some time now. Why were you attracted to this space, and how do your sculptures respond to the decaying landscape? DL: This house was built for the Kreeger family. They lived here with the intention that it would become a museum. They had tennis courts, but no one has played in them since their death. It has just sat. All the roots and vines have taken over. Since the nature of my work is site-specific, when I was offered three different places to choose from, I took one look at this decaying place and was inspired by its neglect. I went berserk with all of these wonderful remnants. 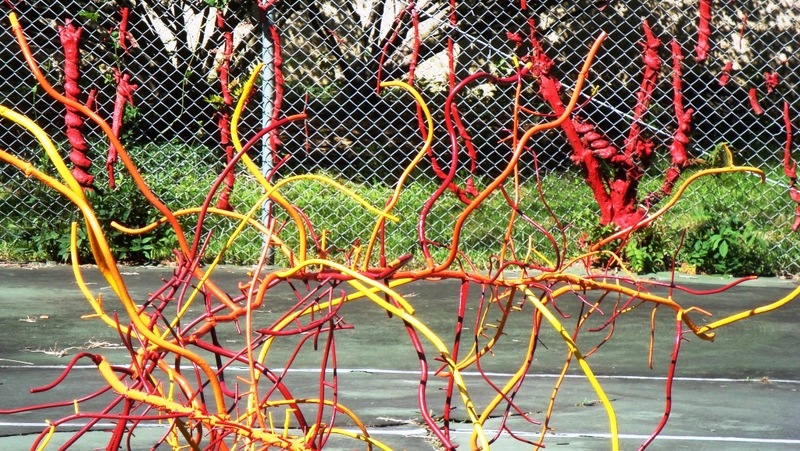 I painted most of the roots and vines that grew on the fence of the courts red, but here and there I would leave them unpainted to draw attention to it not being my sculpture, but a work of nature. Even people who know my work and are aware of my thought process can’t decipher between the two. If they are indistinguishable, it means the work is a success. I realized, as I do more of these roots and as I go to more places, it makes me understand what kind of artist I am and what interests me. I always knew that I was drawn to melancholy. I know life is temporary and it will come to a stop at a certain point. And because of my background, I am very aware of the fragility of it all. No one plays in the tennis court anymore; it is sad. And yet, it is still here. 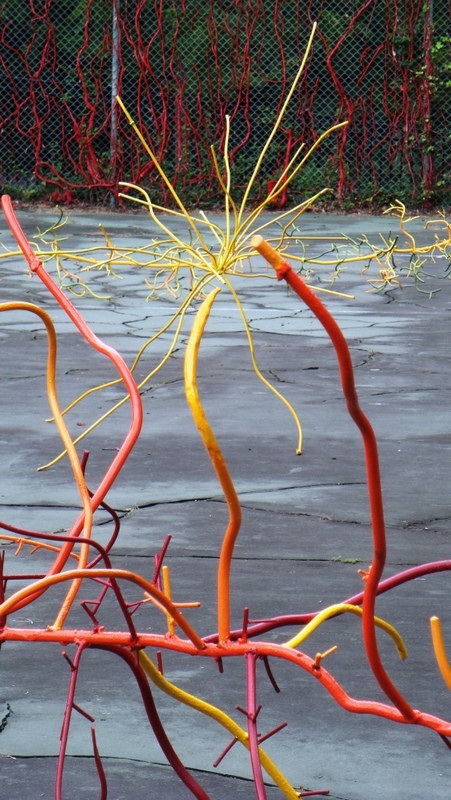 CB: These delicate organic structures are made indestructible by your translation into steel. Why did you choose steel as your medium and what is your process for creating these large works? DL: My medium has always been metal. I like the fact that it isn’t a piece of paper you draw on. Like the roots themselves, steel comes from the soil; it rusts, and eventually it returns to the soil. I like the concept of it. Also, when you weld pieces together, you get a blob of metal. Usually, welders try to get rid of the blob so it looks smooth. But I realized, the more I leave it on, the more natural the piece looks. Steel really suits my sculptures beautifully. CB: What projects are you currently working on, and how has the discovery, or “unearthing,” of your own artwork by curators, museums, and the Venice Biennale influenced your sculpture-making? DL: The more recognition you get, the more confident you are in what you are doing. Success allows me to push myself so much more than before. I am currently working on a project in Bagheria, Sicily. In the 18th century, the nobility built villas that were later abandoned due to land reform. They left after losing their fortune and left the buildings to decay. A resident of Bagheria decided to renovate one of these great villas and transform it into a museum, the Museo Guttuso. She has commissioned one of my root sculptures for the façade. I am also exhibiting a piece in “Sculpting Outside the Lines,” an out­door sculp­ture exhibit in the Foggy Bottom Historic District. I will be sculpting a site-specific suspended root work for outside a resident’s home. The exhibition will be on view April 21 through October 20, 2012. 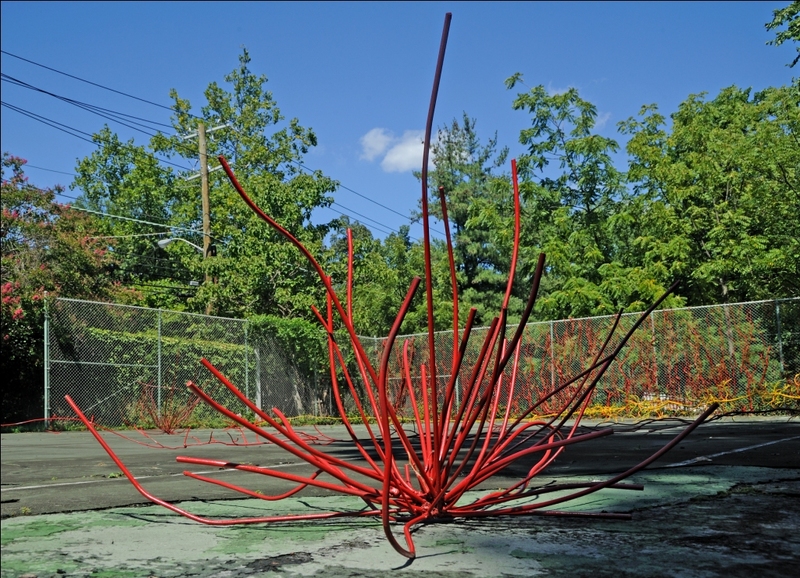 When Nature Takes Over is on view at the Kreeger Museum through July 2013. For more information on Dalya Luttwak’s artwork visit: www.dalyaluttwak.com.